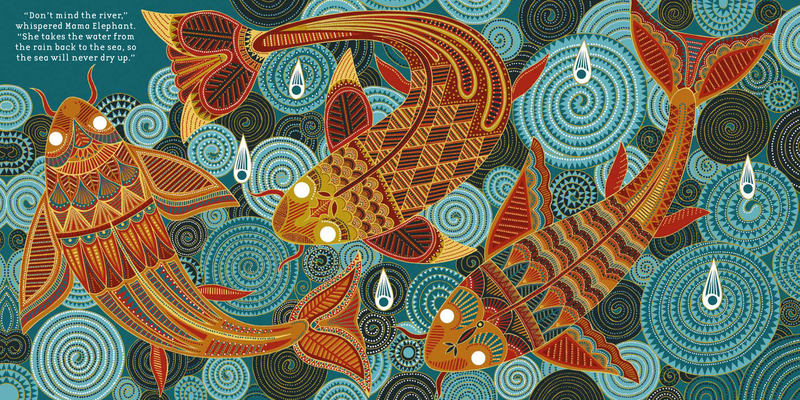 Wallpaper by Thao Lam (2018). 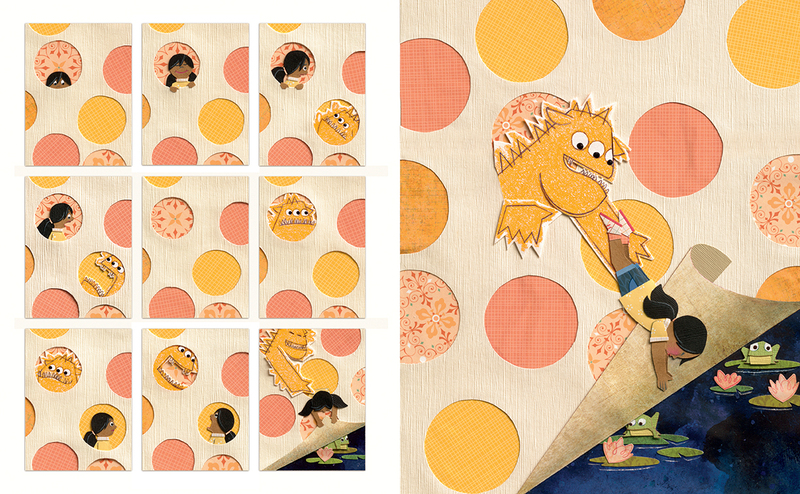 The first thing you’ll notice about this picture book is that wallpaper from the title. Beautiful, Layered. Nostalgic. Full of wonder. 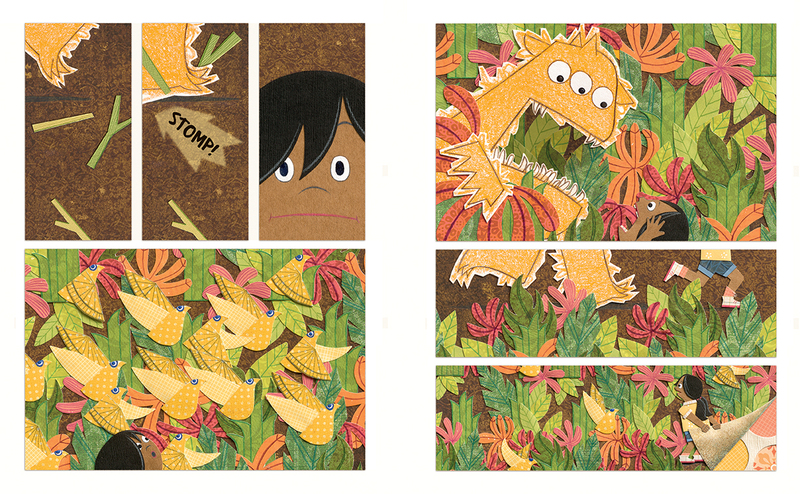 It’s at the heart of this mostly wordless story and contains a whole world that imagination makes possible. A world in which a shy girl gains just the courage she needs through her own creativity and resourcefulness. We’re introduced to a character who’s just moved to a new house and is unpacking her room. Outside her window, there’s a treehouse with other kids in it. They wave. They’re friendly. But waving back is not so easy when you feel out of place or out of sorts. Shy or scared or sad. 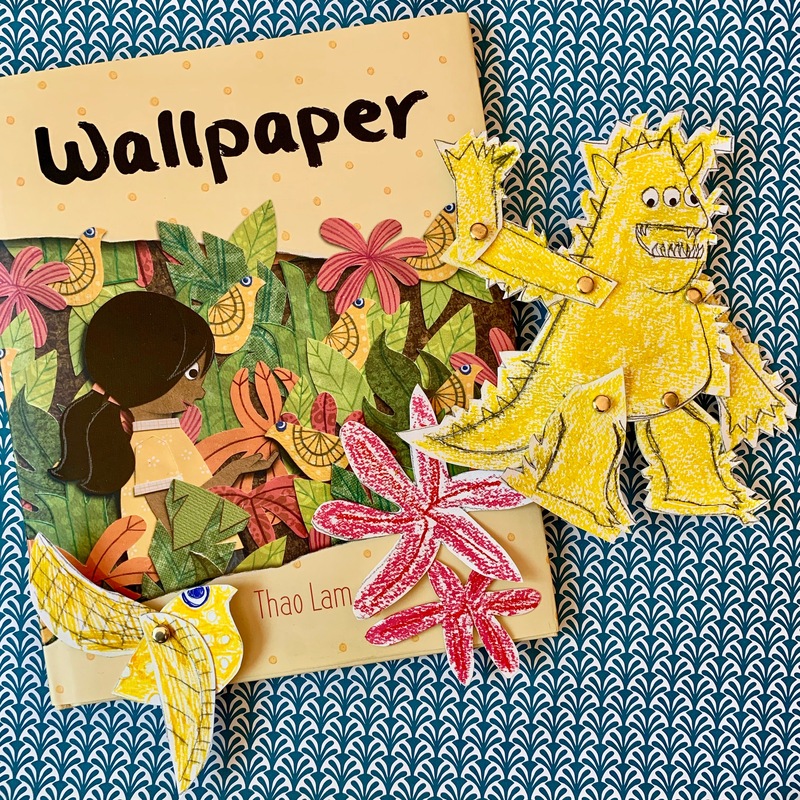 She peels back more wallpaper and follows the birds into a whole world of wallpaper, including a creature who is super scary, but who, it turns out, is actually not scary all. The creature is merely unfamiliar. The creature wants to be friends. The character and creature frolic in fields and play with clouds, all provided by this magical wallpaper. And when she’s back in her room, alone again, the wallpaper isn’t just one pattern anymore. It’s been peeled to reveal all the layers she’s experienced,. Those layers help her remember that she doesn’t have to be so scared, or that she can be scared and still experience new things. They help her remember that unfamiliar might not be ominous after all. And that by peeling back a layer or two, everyone wants to be seen, welcomed and, accepted. Just like her. And that leads to hello, and to more possibility. 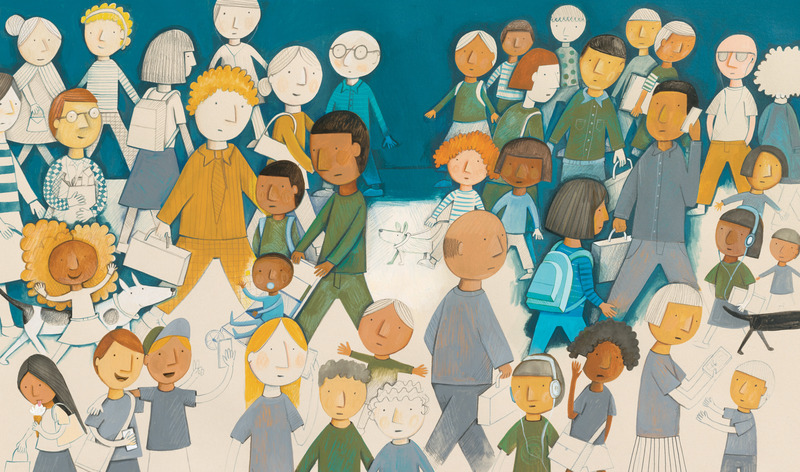 This is an original, artful, hopeful picture book that invites the reader to dive into paper creations and possibility and what it means to reach out to someone unfamiliar and turn them into a friend. Big thanks to Owlkids Books for images and a review copy! Such beautiful papers and such a spirited creature can only mean one thing. 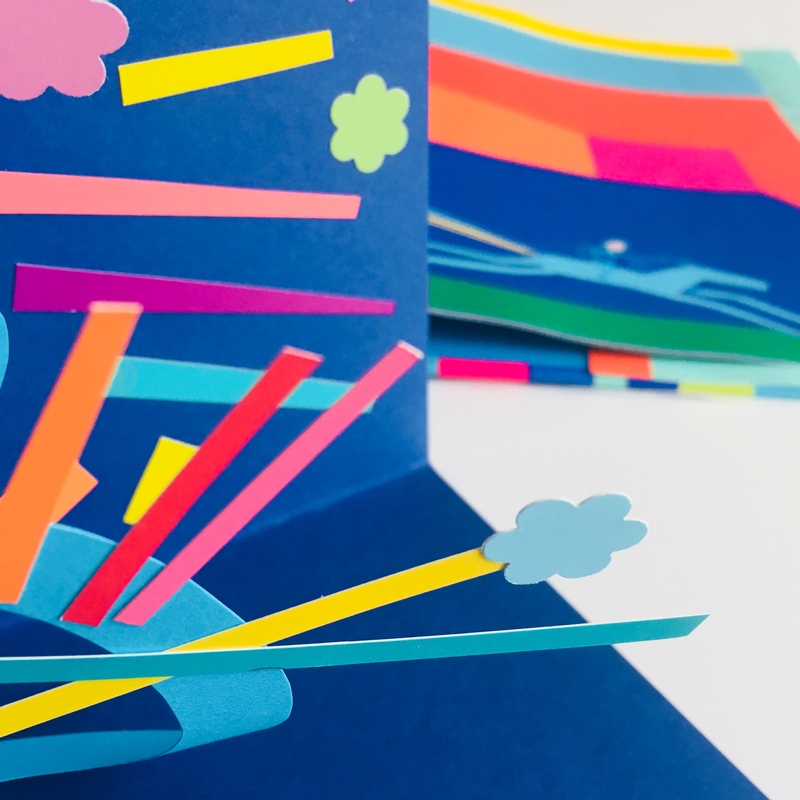 Paper craft! I wanted to make that creature and I wanted to make sure the creature could move. Really, you could make all kinds of paper stuff from this book! 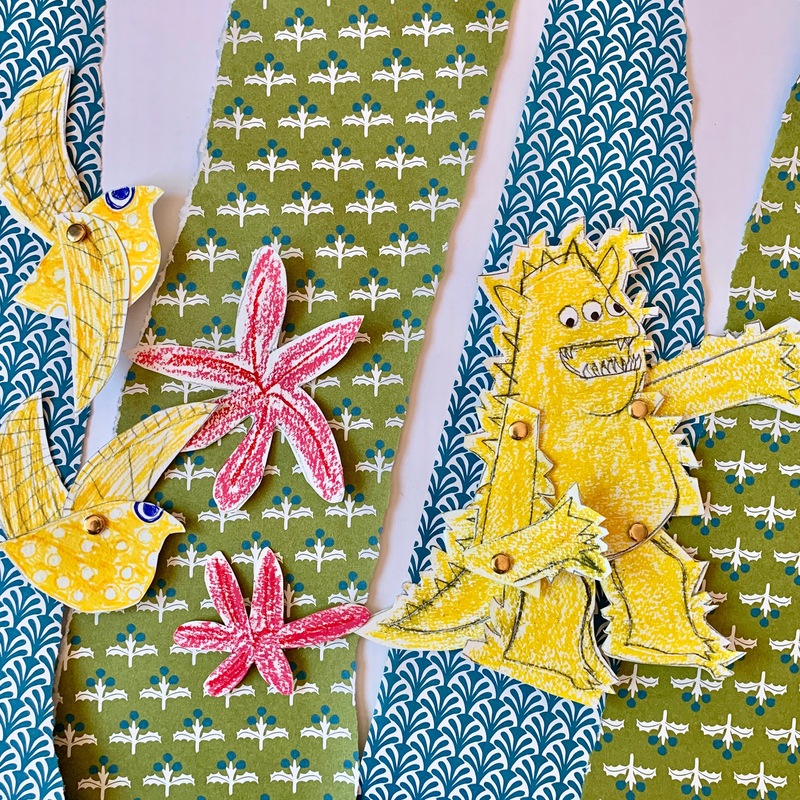 I chose the creature and yellow birds and used brads so they could change position. I started by tracing the creature on a thin sheet of computer paper. Then, with my watercolor paper behind that, I pressed firmly with pencil to leave an indentation I could then trace on the actual paper I wanted to use. Or you can draw the creature free hand! I did the body, arms, and legs as separate pieces, then cut them out. Be sure to leave the pencil lines and make some white space outside the pencil lines to mimic Thao Lam’s style. Next, I colored in the creature! And after that, I attached the limbs with metal brads. 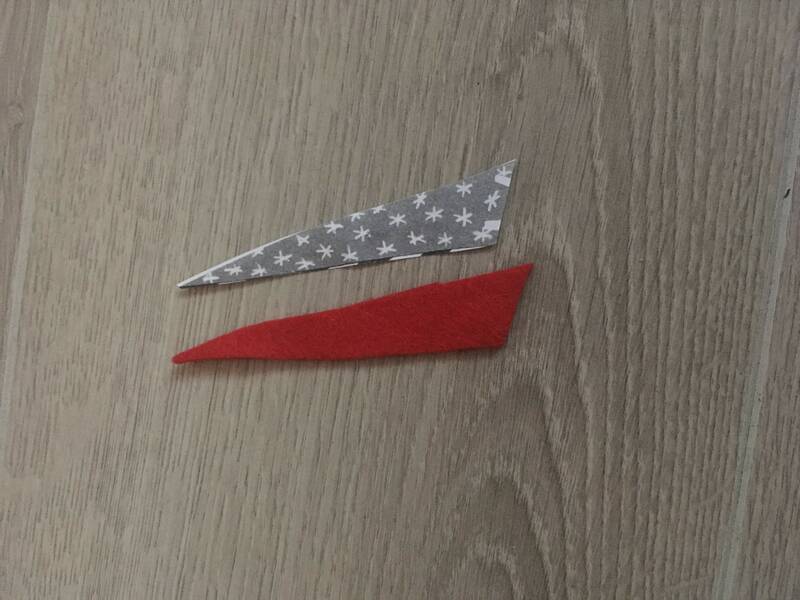 You can poke holes by either pressing the scissor ends into the paper or folding a bit and making a tiny cut. It’s that simple! Now you have a creature you can move about! And it’s the same process for the birds if you choose to make those, and there are many shapes that would be fun to draw, cut out, and color from the book. The sky’s the limit! And check out this gif of the creature moving around! 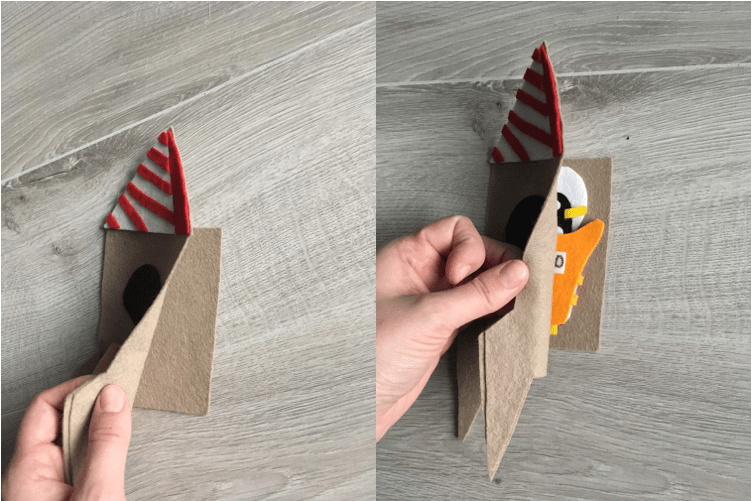 penguinaut + felt storytelling craft + giveaway! 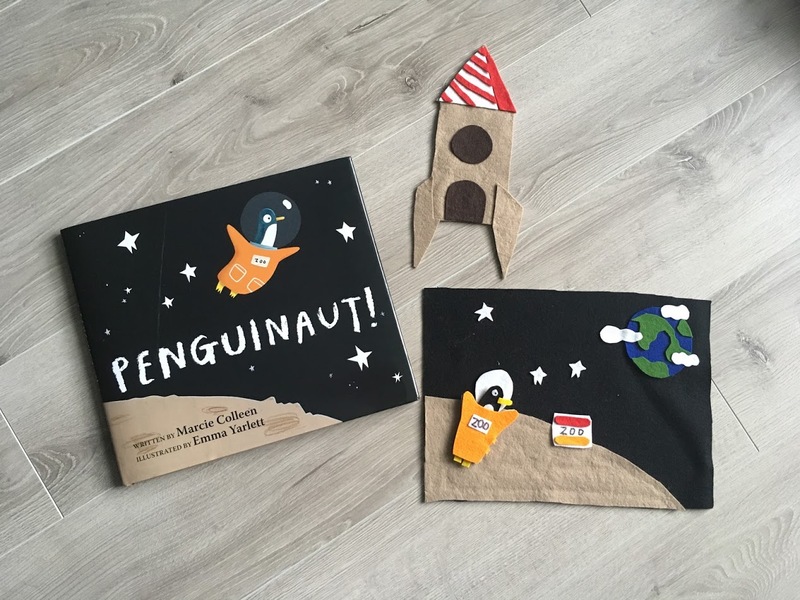 Penguinaut by Marcie Colleen and Emma Yarlett (2018). What really stuck out to me about this picture book is the language. It’s fun. It’s snappy. It’s clever. And it tells the story of this penguin turned Penguinaut named Orville perfectly. Sure, it’s about the big adventure he longs to have and his ensuing trip to the moon. But more than that, it’s about something even bigger: his friends. Orville does have a big adventure. The biggest. But just when he’s overcome with loneliness in spite of it, a note from his friends falls out of his pocket. And that note brings him home, the place where stories of adventure are told: together. And as anyone who’s ever had an adventure and then had the pleasure of telling a friend about it, that’s a pretty big deal. A cheerfully zippy story with a vibrantly sweet heart. Big thanks to Marcie Colleen for images and Scholastic for a review copy! Zoe of Northwest Felts and I met on Instagram a while back and so when I read this book and thought, “felt craft!” I also thought of her wonderful felt creations that are so perfect for not only crafting, but for storytelling too. 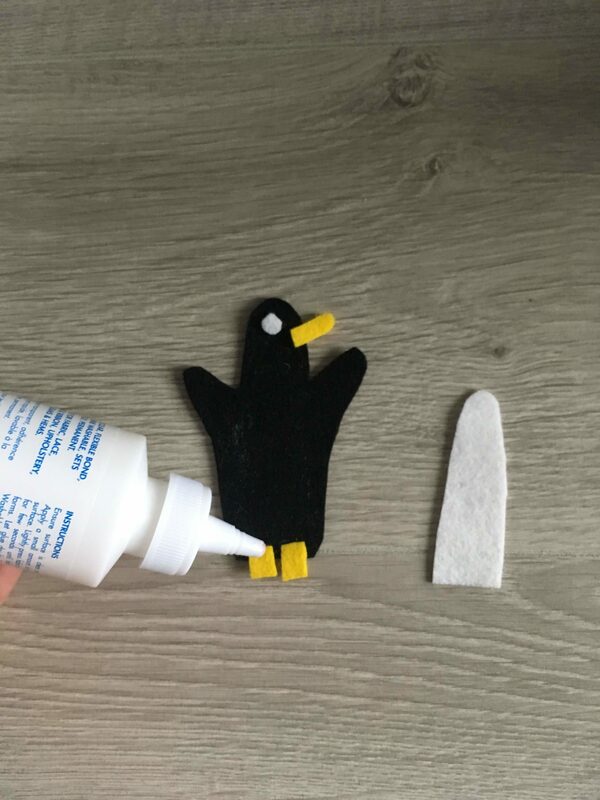 She was kind enough to make a felt storytelling craft for Penguinaut, and is giving it away! When I first read Penguinaut, I was struck by the amazing outer space scenes. Danielle and I both agreed that they should be featured in whatever craft I created. Most of my crafting is done with felt as the medium, and it seemed like the right choice for the Penguinaut craft, too! I wanted to make something that could be manipulated and played with after the actual craft was complete, almost like a felt story. I also wanted the craft to bring to life the “do it yourself” struggle all children and parents (and Penguinauts) inevitably go through. *Children’s scissors are my secret weapon for cutting felt. **I used photocopies from pages of the book in order to get the characters just right. If you’re skilled at drawing, you could easily draw the characters instead. 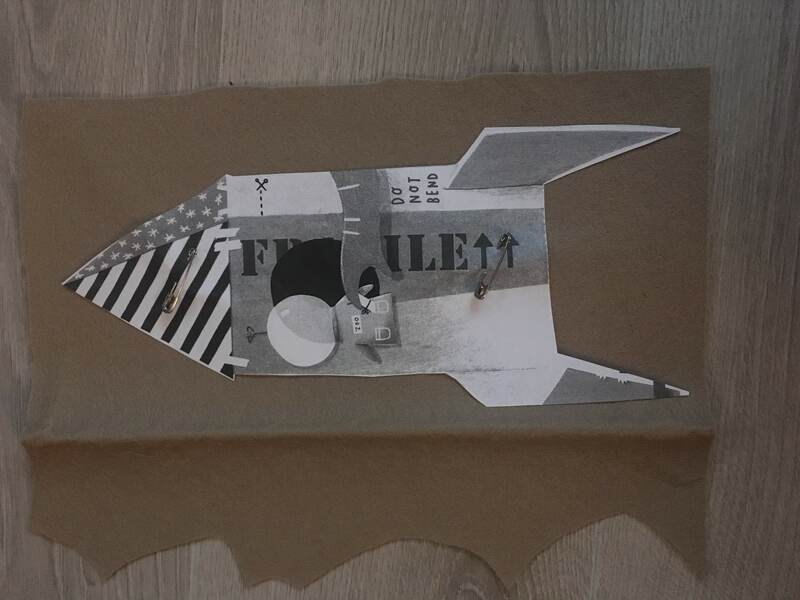 In order to make this a craft that older children can do by themselves, I would suggest getting photocopies of the main pieces from the story (the Penguinaut and the space ship are the two that I focused on, but get photocopies of whatever you want to create). You can use the photocopies in two ways. The first is to trace the photocopy onto the felt and cut out the traced image. The second way is to safety pin the photocopy onto the felt and cut out around the photocopy. I used the second option because it creates cleaner lines. To create a cleaner finish, you can glue penguinaut’s feet in between his white tummy piece and the rest of his body. Now that we have a penguinaut, we can work on his space suit. I wanted him to fit inside the suit, so I made a suit that can open and close. I did this by first cutting long, thin strips on orange, to create hinges. Next, I glued them, half to the white backing of the suit, and half to the orange front of the suit. Finally, I folded the suit over so the hinges were hidden on the inside. 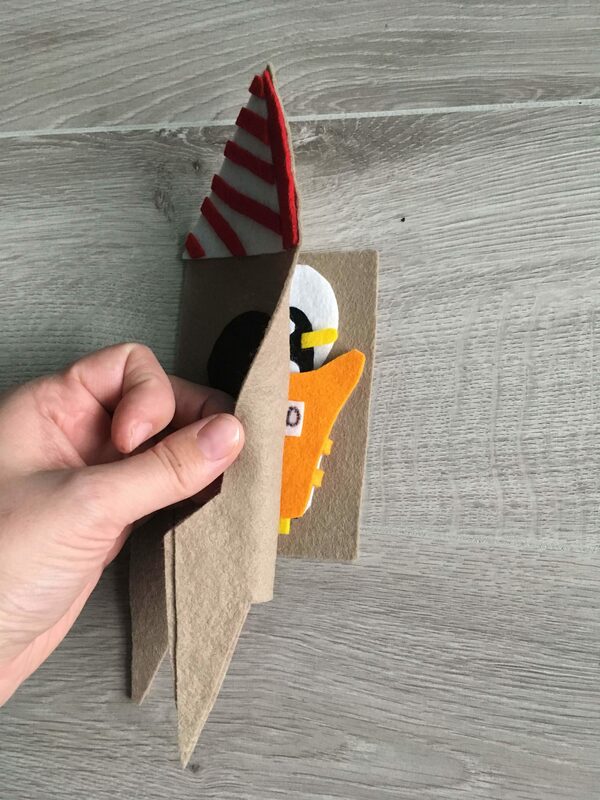 I also wanted Penguinaut to be able to get into and out of his spaceship, so I glued an extra piece of beige felt to the back. This created a little nook that penguinaut can sit in during his space adventure. For the background, I chose to do the outer space scene. I loved the colour contrasts and the twinkling stars. 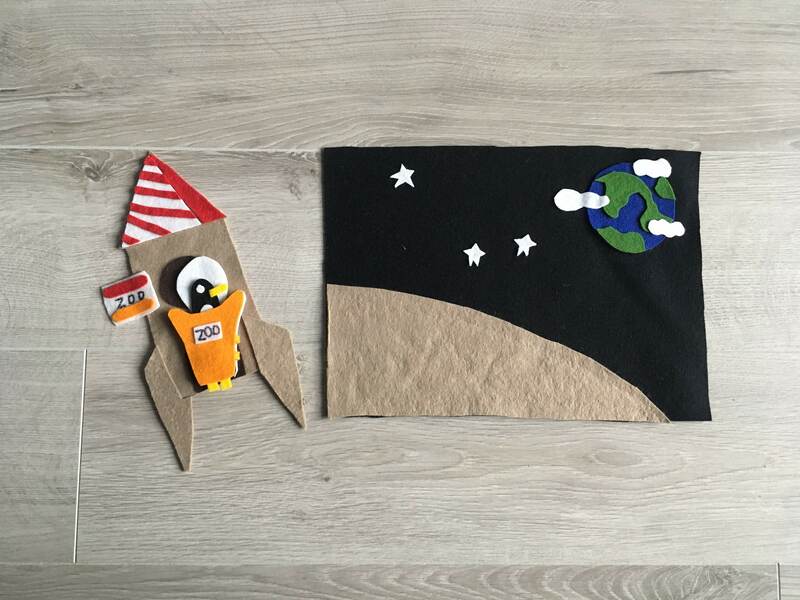 Some of the pieces are glued down (Earth, the Moon, the clouds and stars) while other pieces are left unglued so that they can be moved and played with (the spacesuit, Penguinaut, and the flag). Have fun with this part! I wanted to stay true to the illistrations in the book, but you can create different scenes based on your favourite part of the book (or your favourite part of space)! I love the idea that you get to choose what to glue down and what to leave free to move around. Giving these choices can create a fun experience that can be revisited over and over again. When the craft is done and you’ve finished exploring and playing with it, I love the idea of storing it on the wall as art. If you put it up on a felt board, a child can take it down and play with it whenever they want. Zoe is the maker at North West Felts. 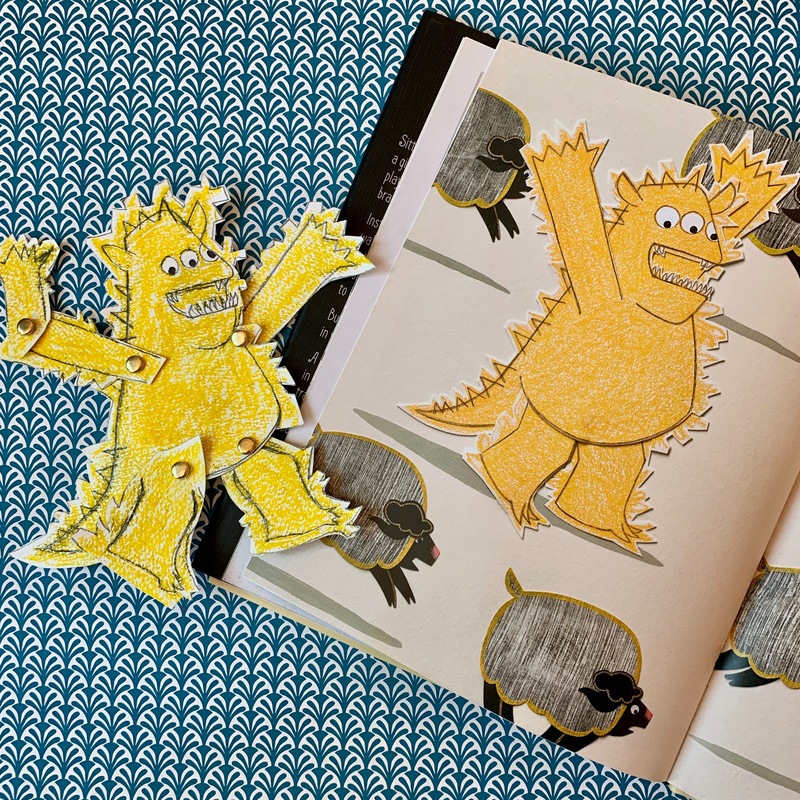 She loves using felt stories to create literacy experiences through play. Zoe’s favourite Felt set is Slippery Fish! She is a huge fan of children’s literacy and loves reading stories with her 2.5-year-old and her 8-month-old. Zoe is currently on maternity leave but will return to work as an Early Childhood Educator in the Spring. 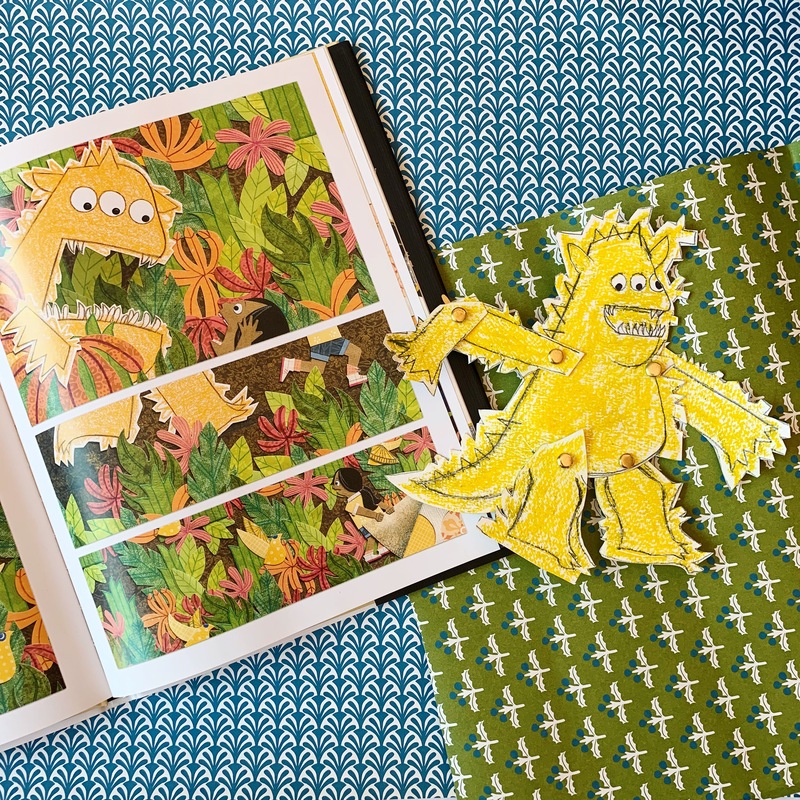 When she isn’t reading, she is using books as inspiration for her felt creations. Find her on Instagram and Facebook @northwestfelts. Good news! 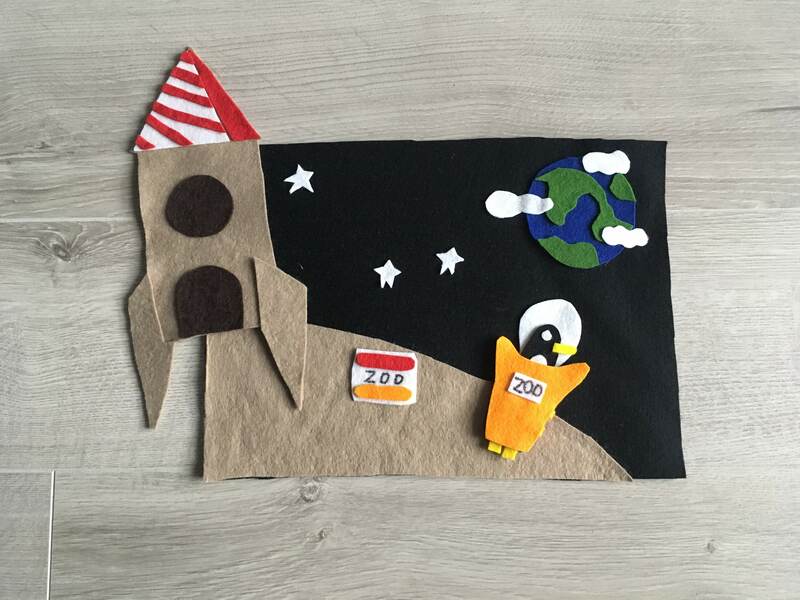 We’re giving away a copy of Penguinaut and Zoe’s felt craft set to go with it! Enter below (N. America only). 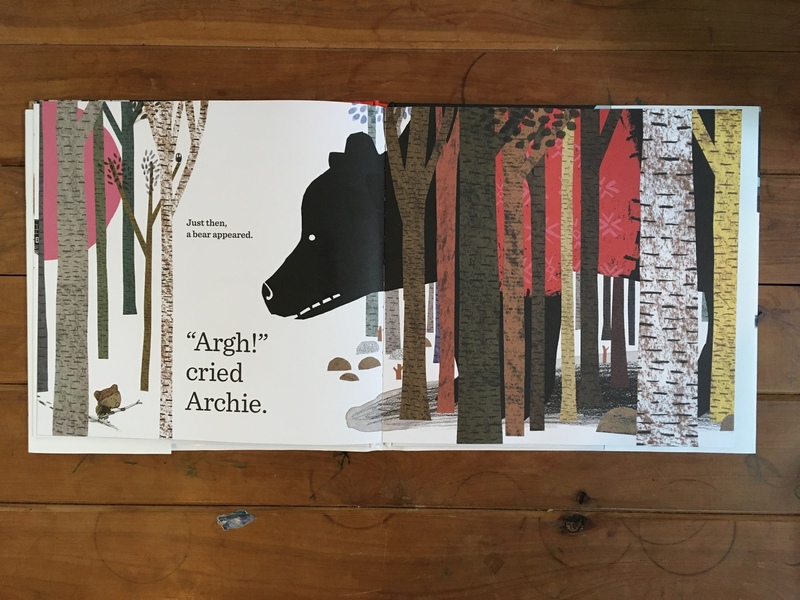 Archie and the Bear by Zanni Louise and David Mackintosh. 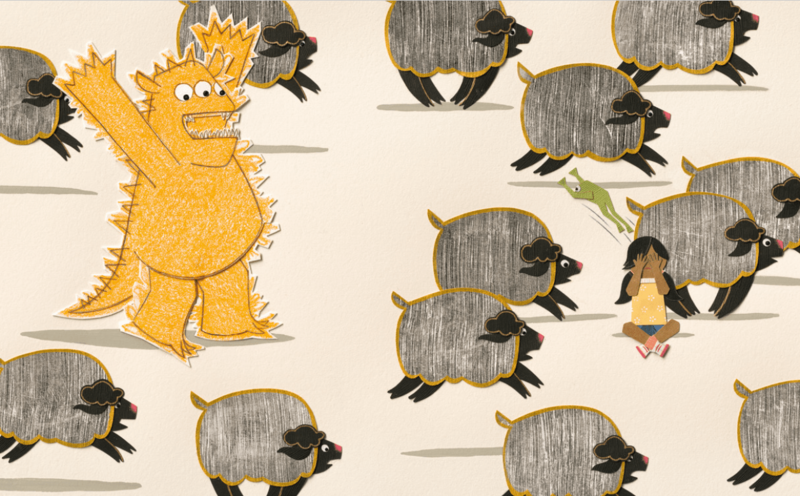 This picture book takes a bit of mind-bending, and that’s fine by me. There’s a boy who believes he’s a bear. 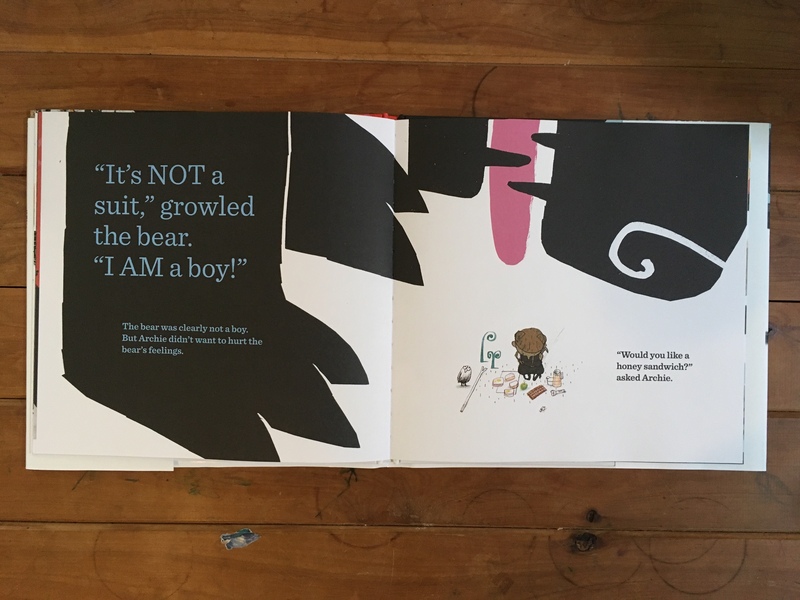 There’s a bear who believes he’s a boy. And there’s a friendship of misunderstoods who understand each other. This is one of those stories that affirms a child’s view of things and leaves adults of out it. I love books like that. 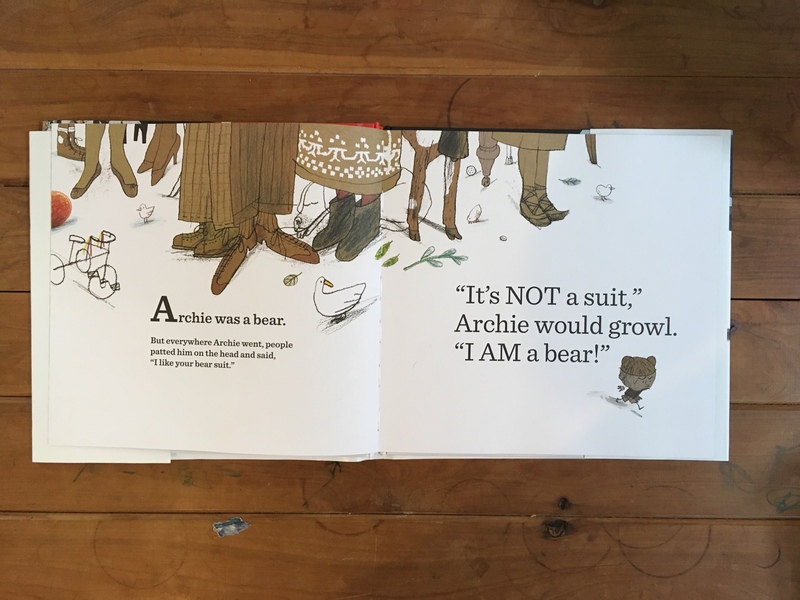 Archie is fed up with no one believing he’s a bear, so he goes to the forest. Where bears live. And he meets one. A bear who believes he is a boy! The pair share honey sandwiches and teach one another. Archie teaches the bear the ways of being a bear. The bear teaches Archie the ways of being a boy. And eventually, they go home and find that both bears and boys like sitting by the fire with a warm blanket. Every kind of creature likes that. Mackintosh’s dynamic and varied illustrations zoom in and out and play with scale in wonderful ways. They combine stark contrasts and soft watercolors and pencil drawings. They sometimes leave things out. The artwork is both simple and complex, like the story. 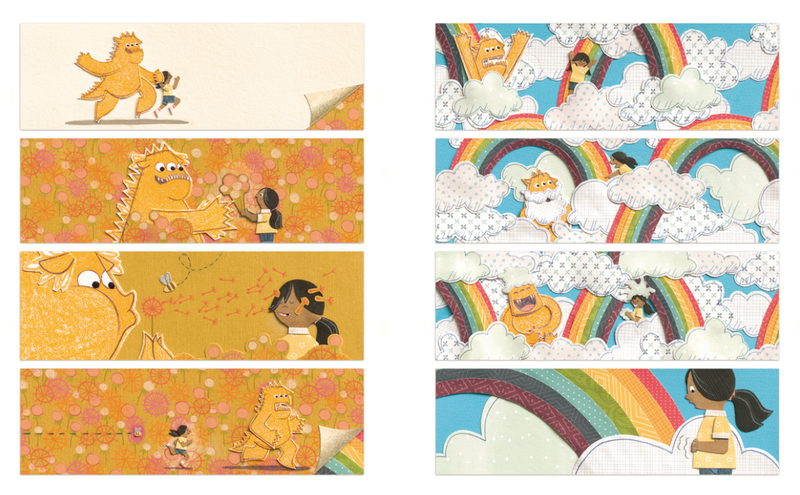 This is an inventive and satisfying picture book about affirming one’s imagination and finding a kindred spirit. Big thanks to Zanni Louise for images! 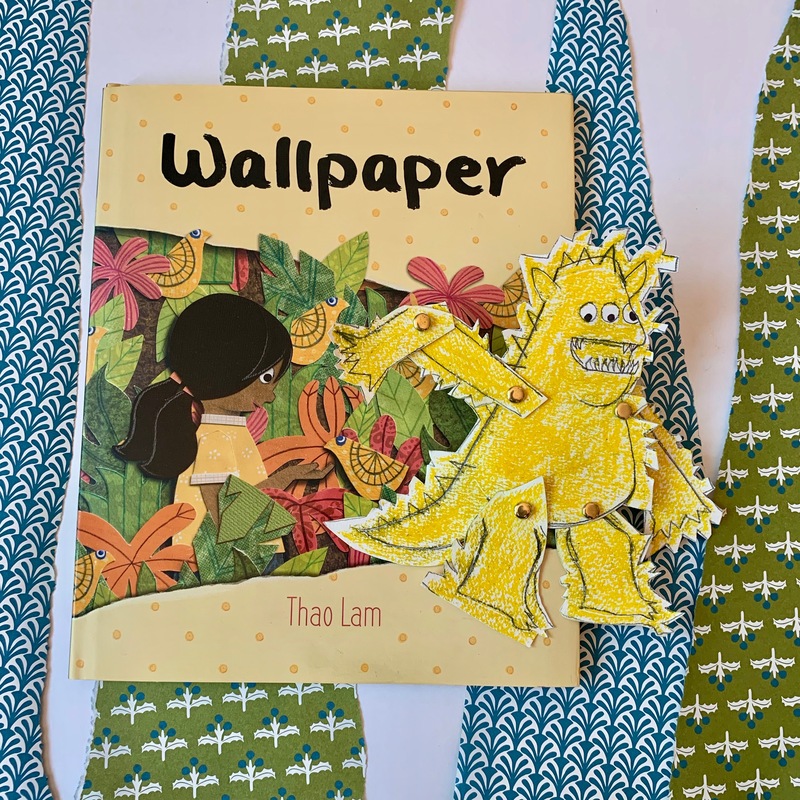 I’ve been waiting for cooler weather to post about this book, and since it’s Halloween-time, what better picture book craft than the costume-y kind! 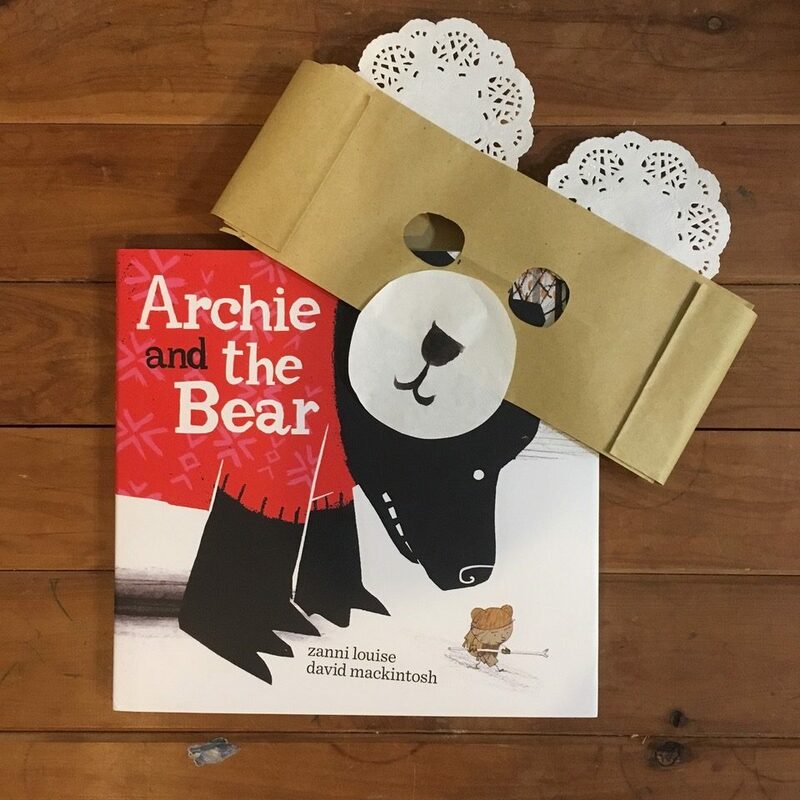 And we’re very lucky because Zanni Louise, the author herself, has stopped by to show us how to make a bear hat and be like Archie. Or like the bear. 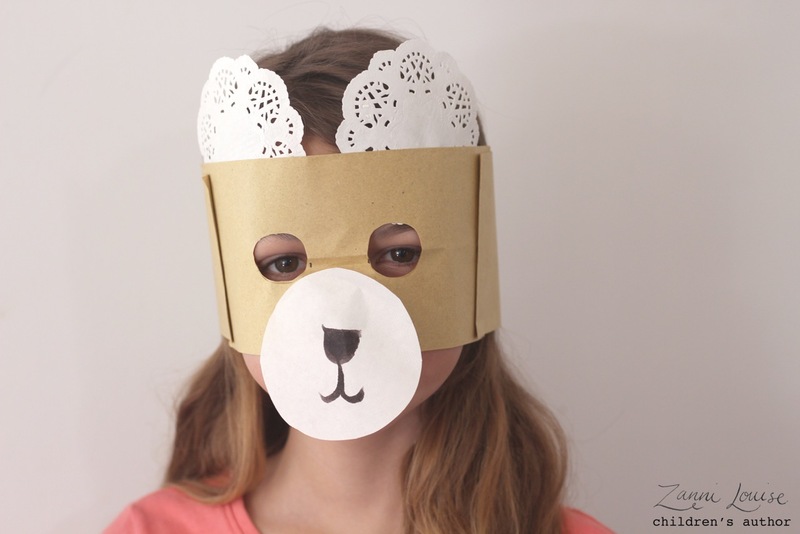 Well, how to look like a bear anyway. Cut paper bags in half, lengthwise (top to bottom). 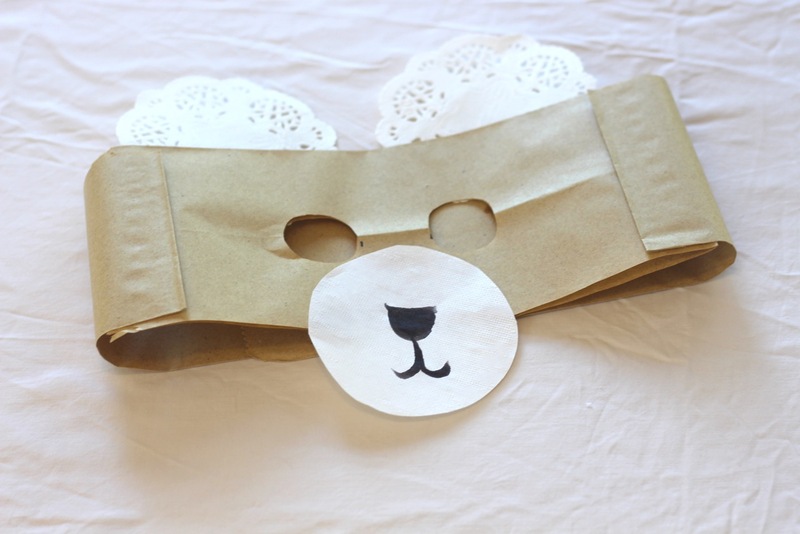 Take one piece of brown paper bag, and fold lengthwise. Roughly calculate the centre point of the strip, and on the fold make two dots approx 3cm / 1.25 inches apart. These are the inner corners of the eyeholes. 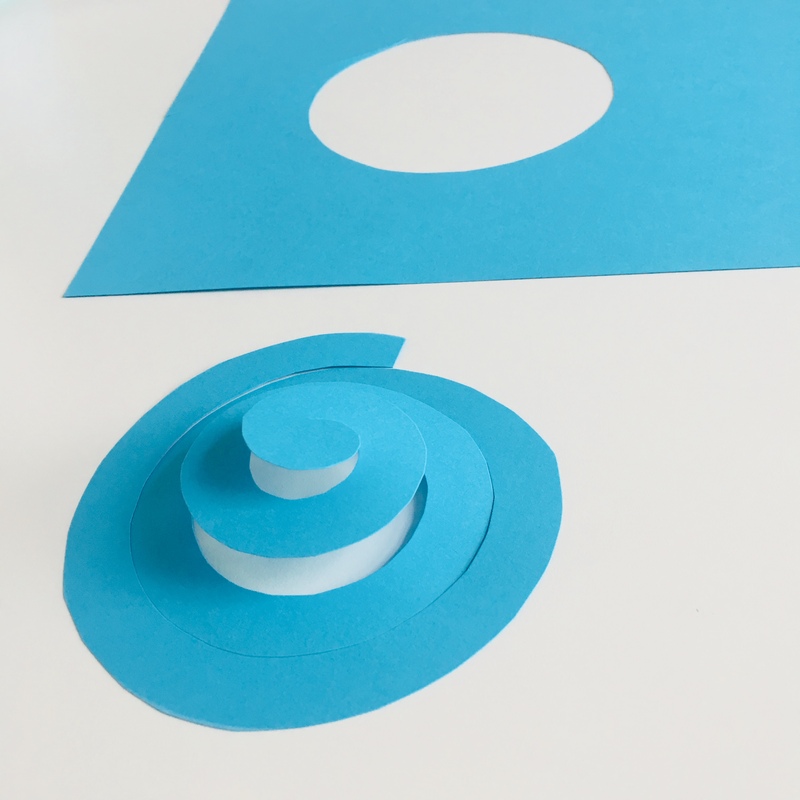 On the fold, use markings and cut two semi-circles for eyes. Unfold. 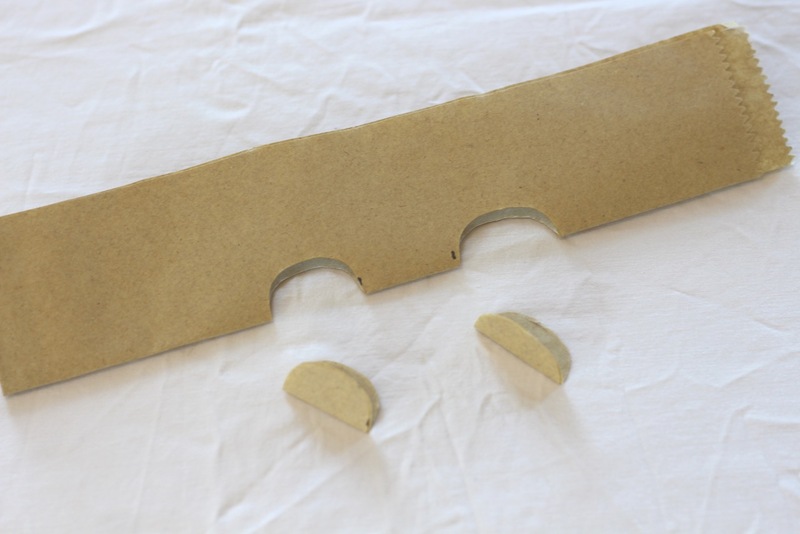 Stick three brown paper strips together, which make one long strip, with the eyeholes in the centre strip. 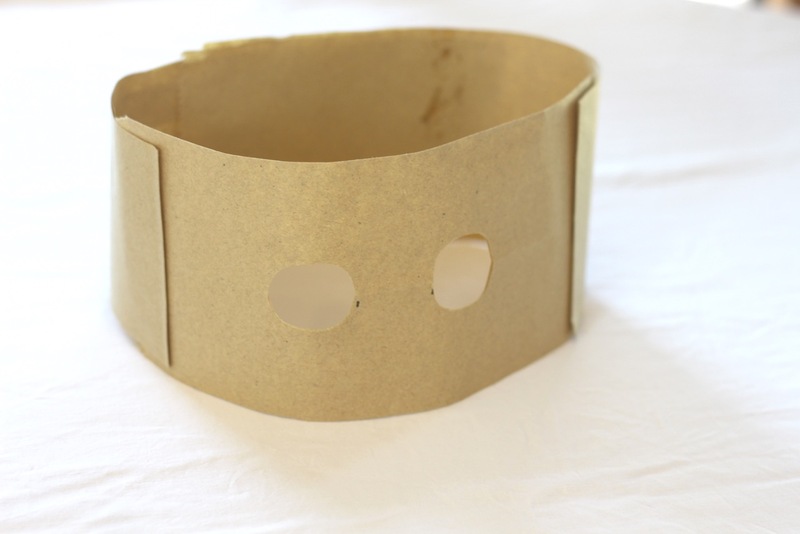 Make a crown around the child’s head, which goes over their eyes, and stick ends together to fit crown securely. You may need to trim ends, depending on the head size. Aim for a big overlap though, as this will be more secure. 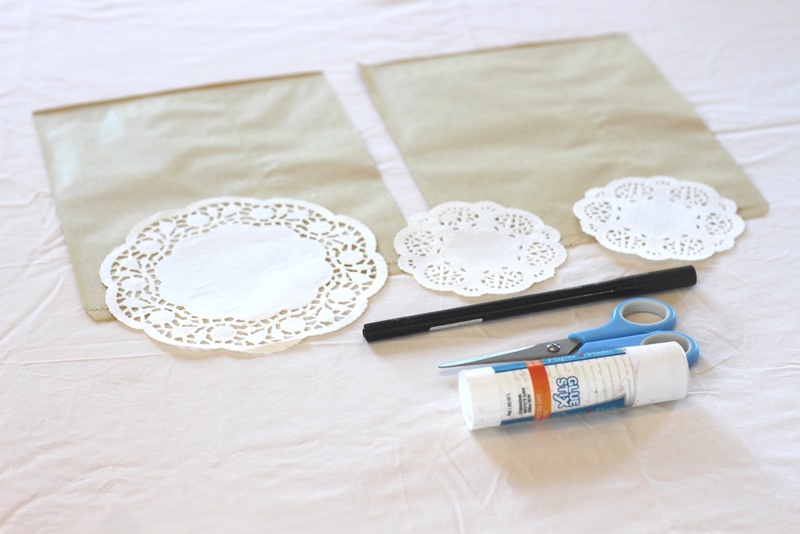 Using the larger doily, trim away the ‘lace’ so you are left with a round circle. You can also use white paper or board for this. 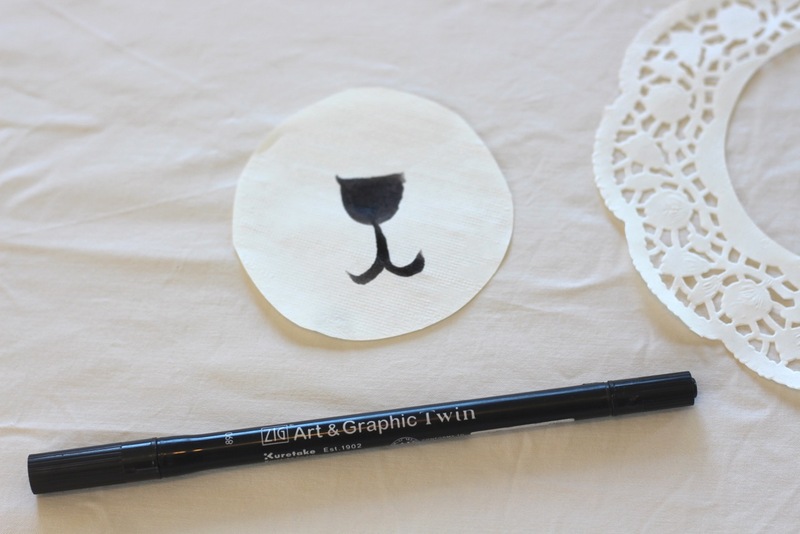 Draw a black nose and mouth on the white circle, and fasten to your crown, between the eyes. The bottom half of the white circle will hang over the child’s nose and mouth. Attach the smaller doilies above the eyeholes, on the inside of the crown. These are the ears. Voila! Your child is now a bear. 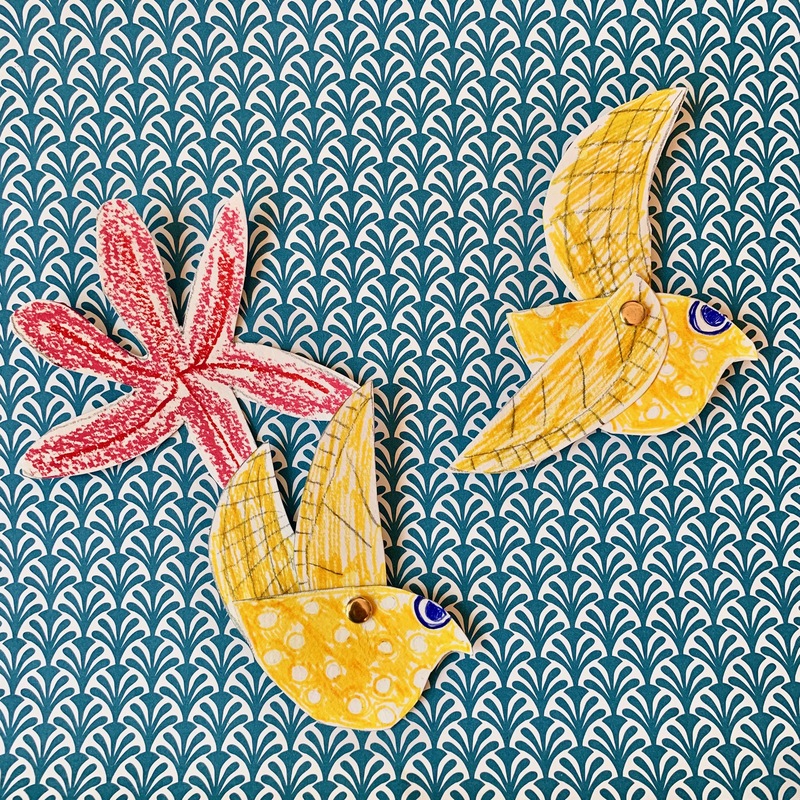 You might also like this Bob the Artist beak craft! 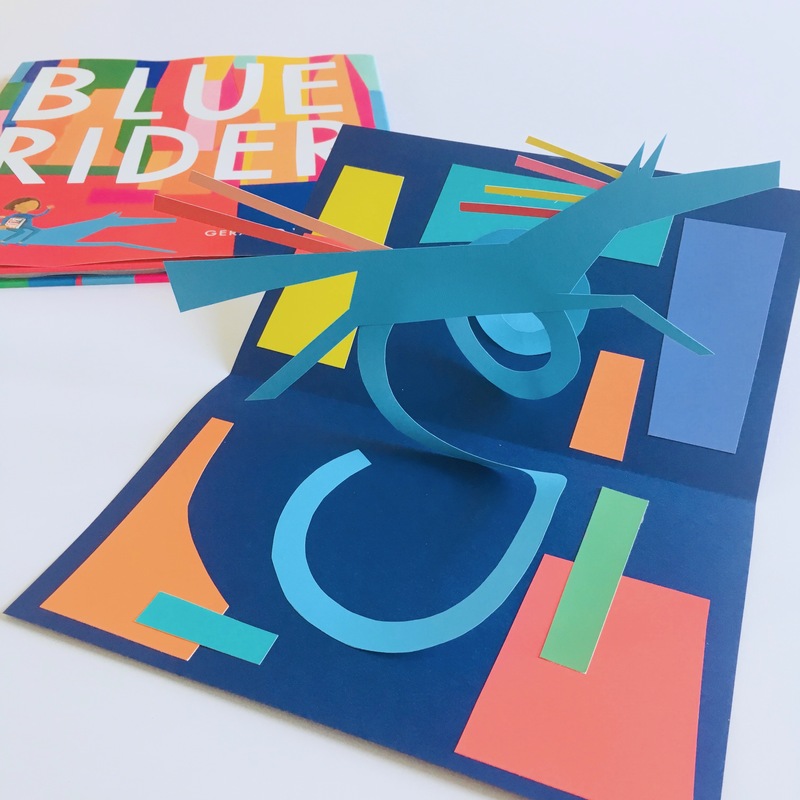 blue rider + pop-up paper craft by homemade city! Blue Rider by Geraldo Valério (2018). 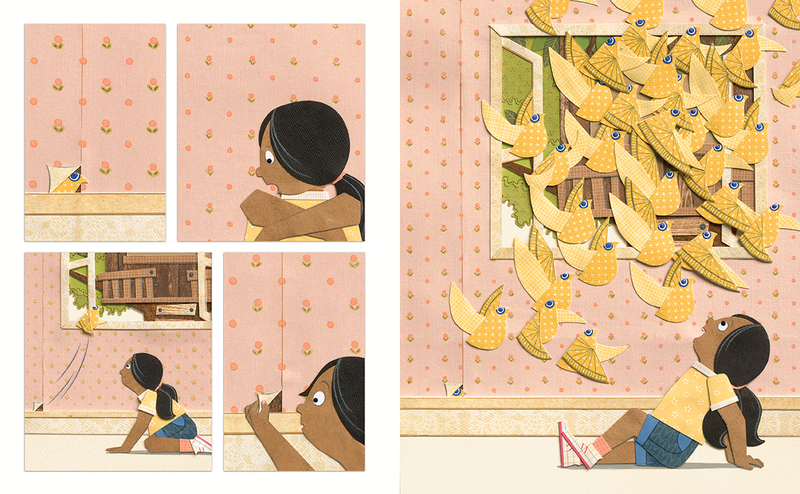 This book is a stunner—wordless and captivating. The colors! The cut paper! The journey from the uniformity of the everyday to the magic of story and art and imagination. All because of a book! The story is simple. A child finds a book with a blue horse on it on a city sidewalk. 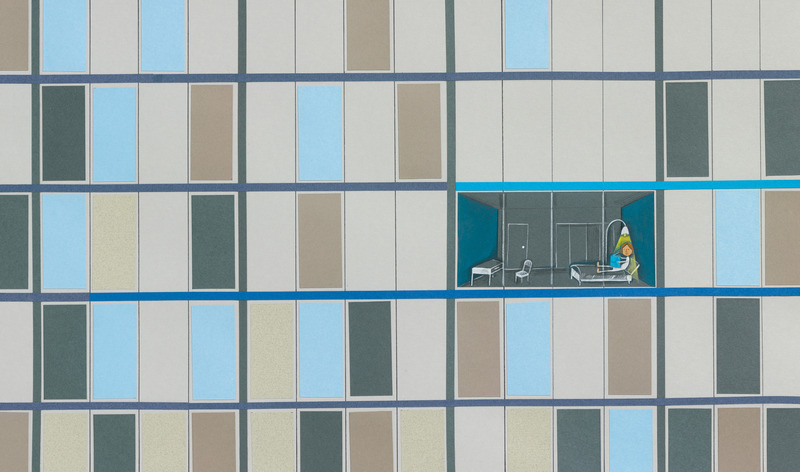 Back in her apartment building, we see her reading in her room, the rest of the windows around her opaque and beige. But she’s reading this bright blue book with a bright blue horse on the front. And then, we glimpse the vibrant, exuberant horse inside! It’s mid-jump and kind of carries the girl away, and into the book. Out of everyday life. 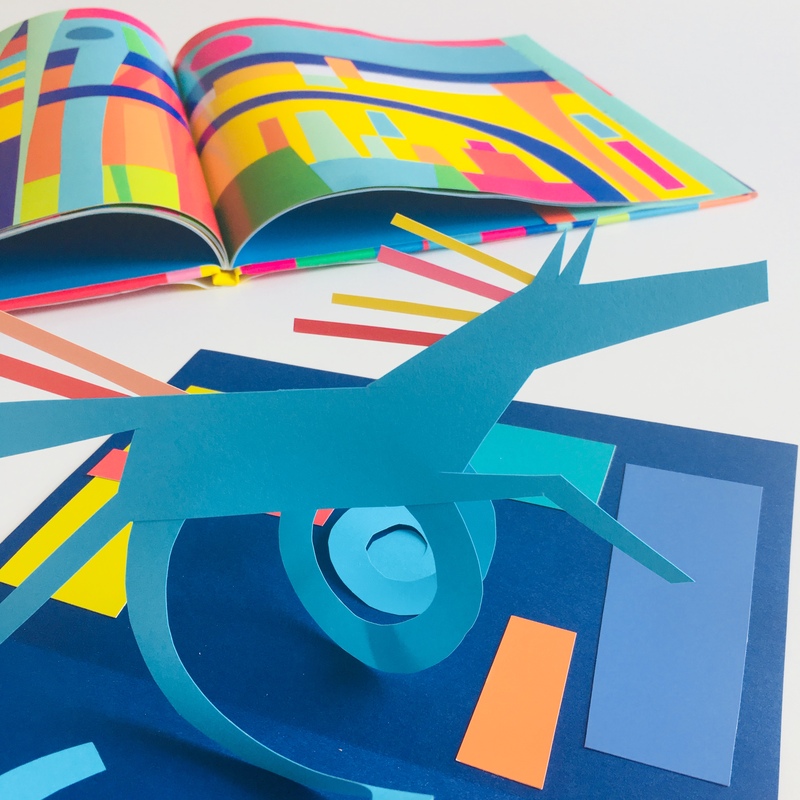 Pages continue like that—we are in the book with the child, the horse artwork getting more and more colorful and more and more abstract. Now, the child’s room (and world and imagination) are filled with art and color and shapes and possibility. The child rider of the horse in the story certainly moves beyond—her surroundings, her modern, mundane world, her limits, by riding that horse out of the book and into her life. It moves her, it changes her, it shows her all kinds of possibility. Just the way reading and art can do. Big thanks to Groundwood Books for images! 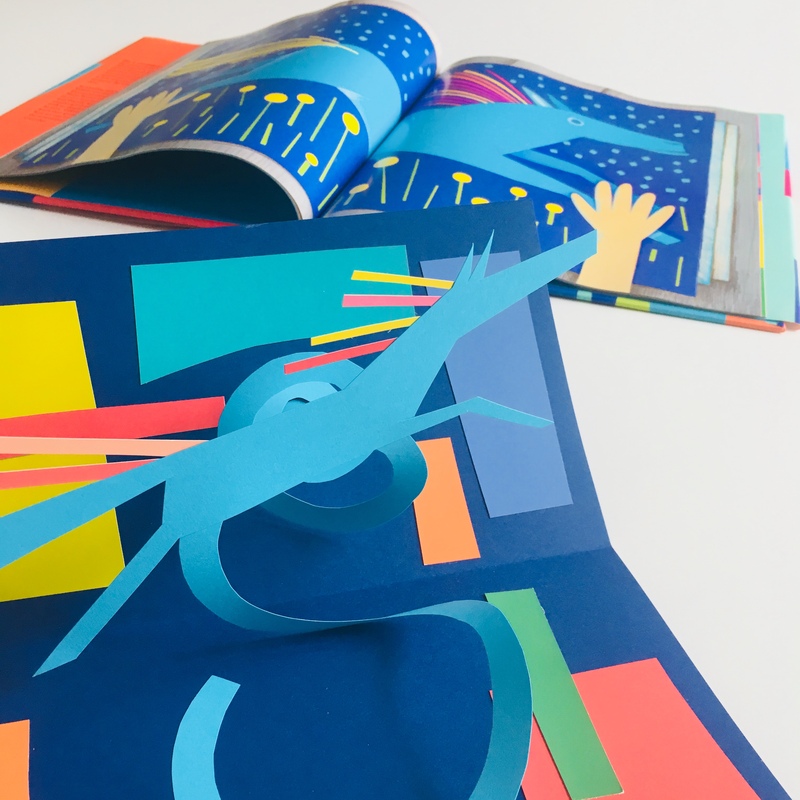 I’m delighted to have Margaret from the wonderful literary kids’ craft blog, homemade city, here to share a truly exuberant Blue Rider craft with us! I’m a huge admirer of Margaret’s aesthetic and creations—her crafts are a must see (and make!). 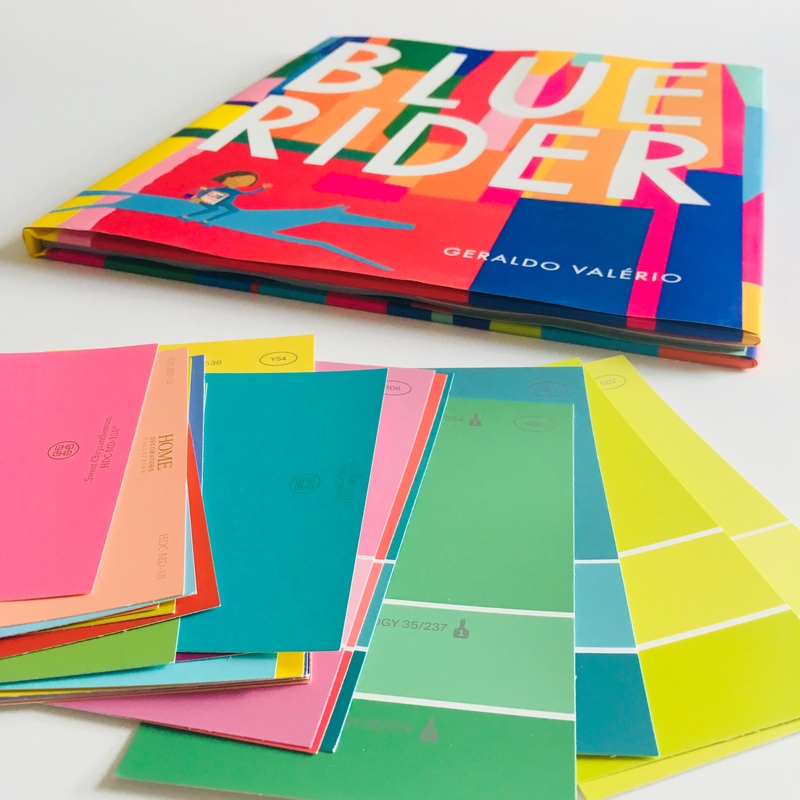 When you open the cover of Blue Rider by GeraldoValério, you’re met with delicious saturated color in an array of forms and shapes. 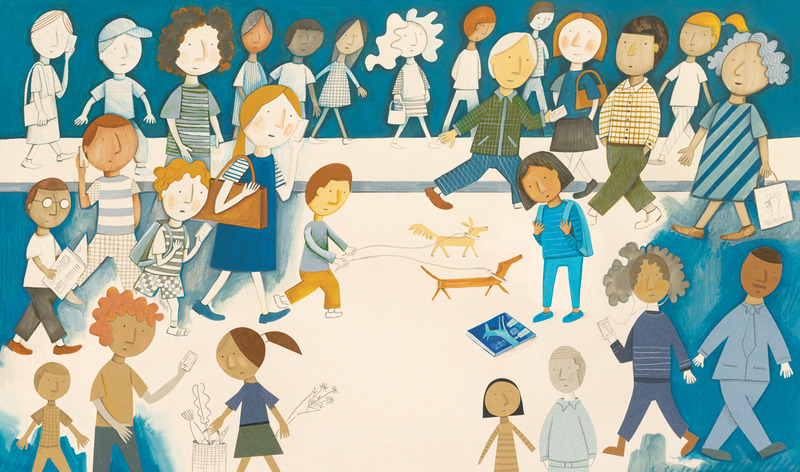 It’s a treasure just like the book that the child character discovers on a city sidewalk in this wordless story. 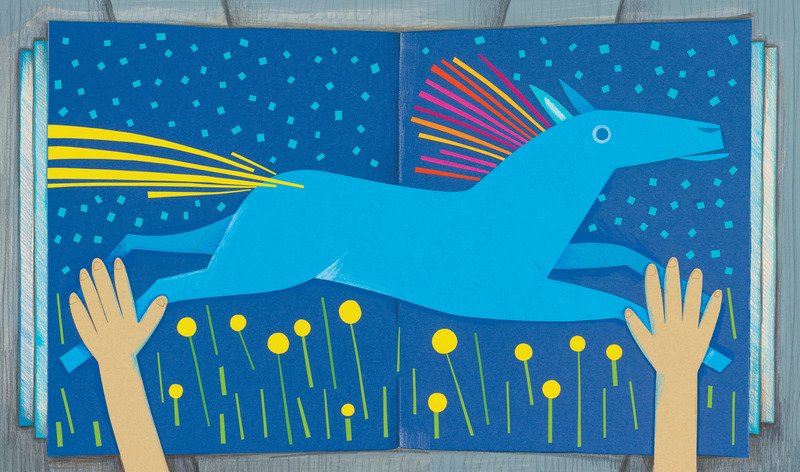 As the child opens the book, a blue horse leaps across the sky streaking the city’s gray grid with a spray of color. 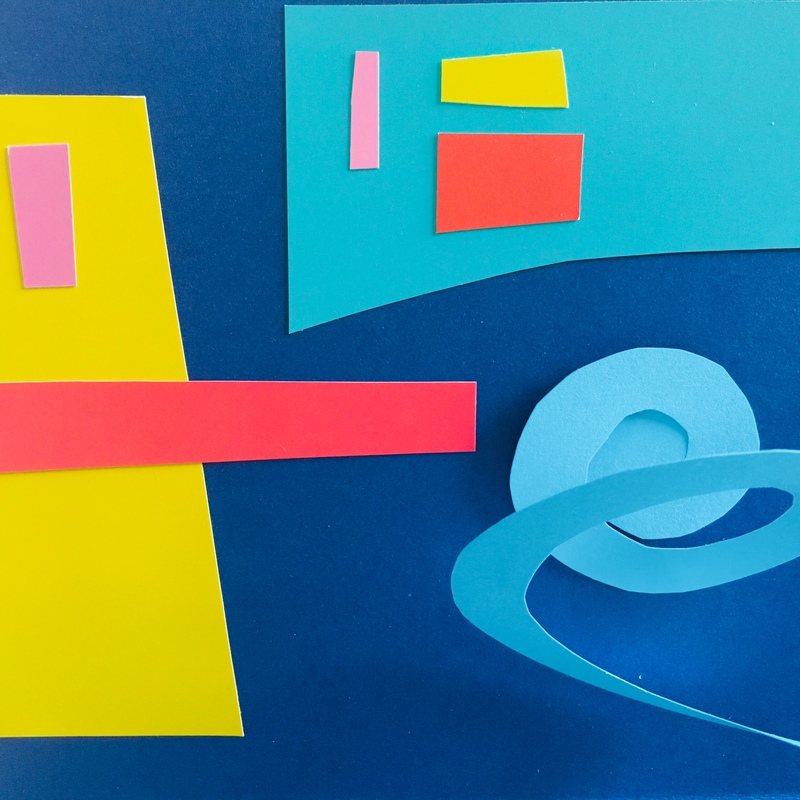 When Danielle suggested I make a craft for Blue Rider, I happily took up my scissors and glue stick. But how best to reproduce the surprise and pleasure that a reader, like the child in Blue Rider, can find just by opening a book? How about a pop-up? With collaged bits of jewel-hued paper. And a blue horse, of course. First, fold a piece of paper in half. I used an 8 1/2 x 11″ sheet of dark blue card stock. Set it aside. Dab glue to the center of your spiral. 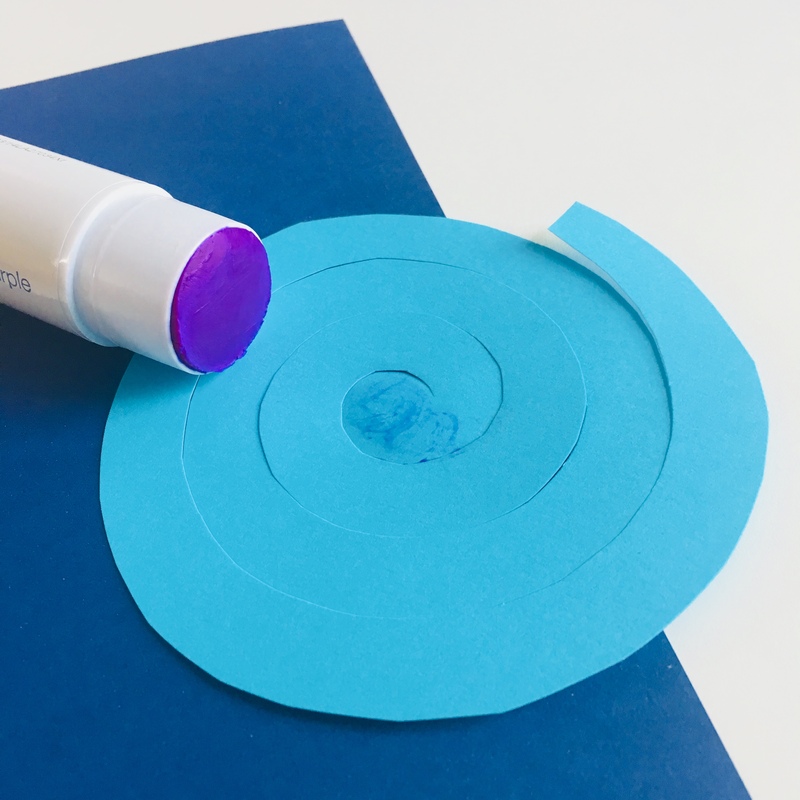 Place your circle (side with glue facedown) inside of your folded paper. Apply glue to an inch or two of the exposed tail of your spiral. Press the folded paper closed so that the glued tail will adhere to the other half of the paper. 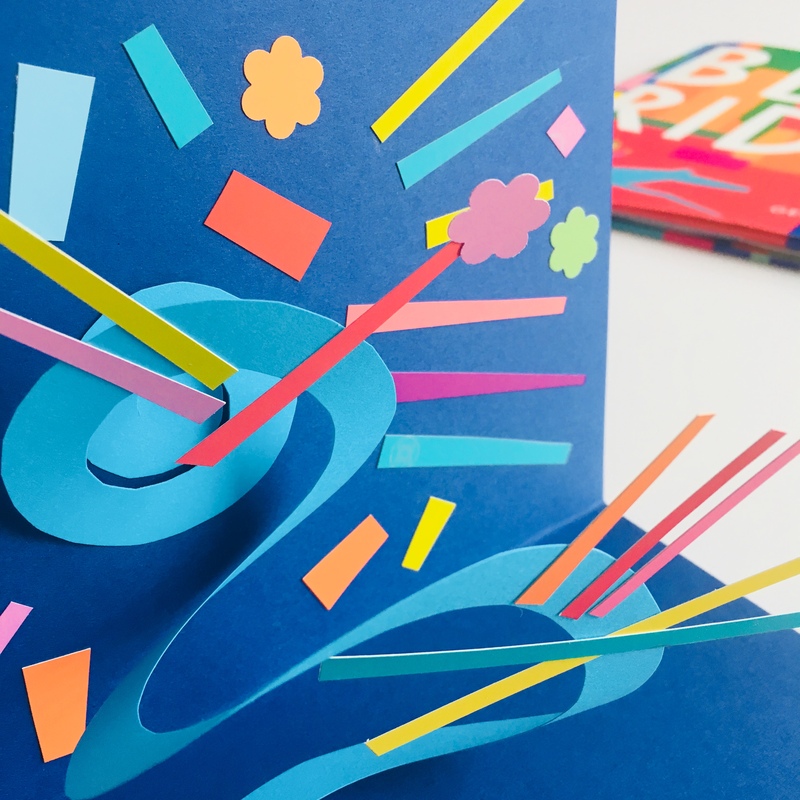 When you open the card, the spiral will pop up like a spring! 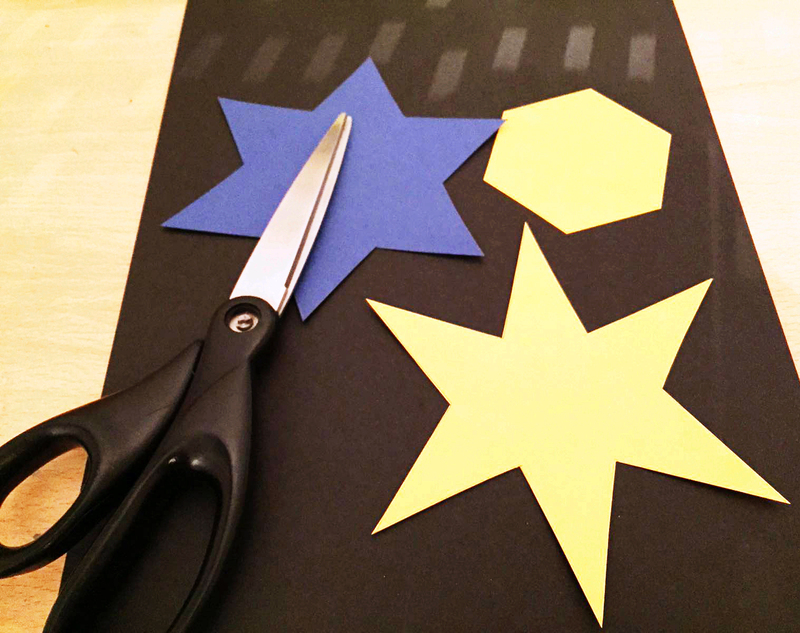 Now for the fun—cut shapes or hole-punch dots or stars or flowers from your paint sample color cards. If you want to write a message, trace letters and cut them out—whatever pleases you! 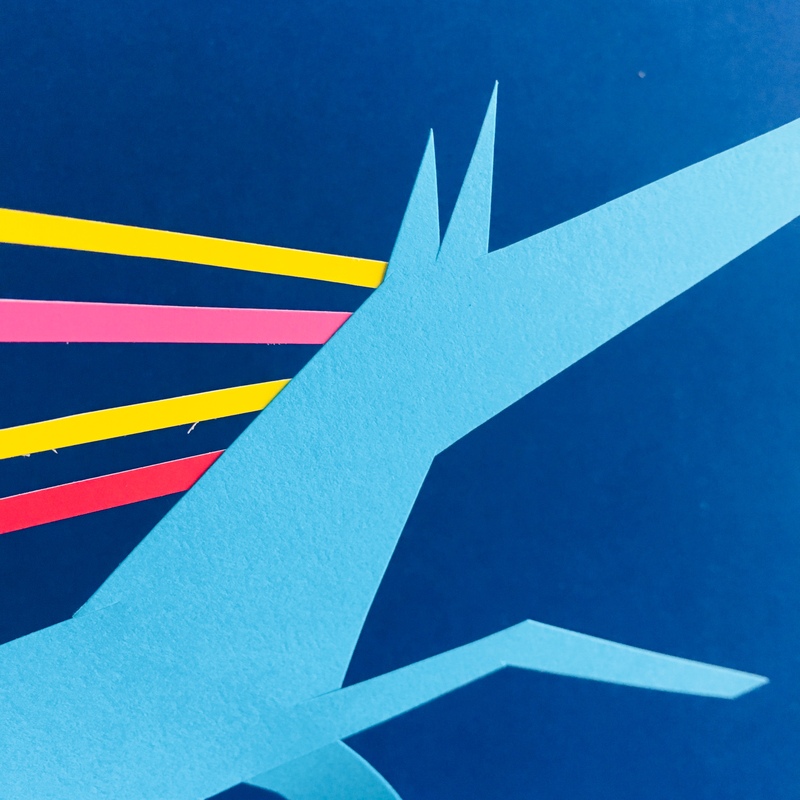 I cut out a blue horse and fashioned a rainbow mane like the one that canters across the city sky in Blue Rider. 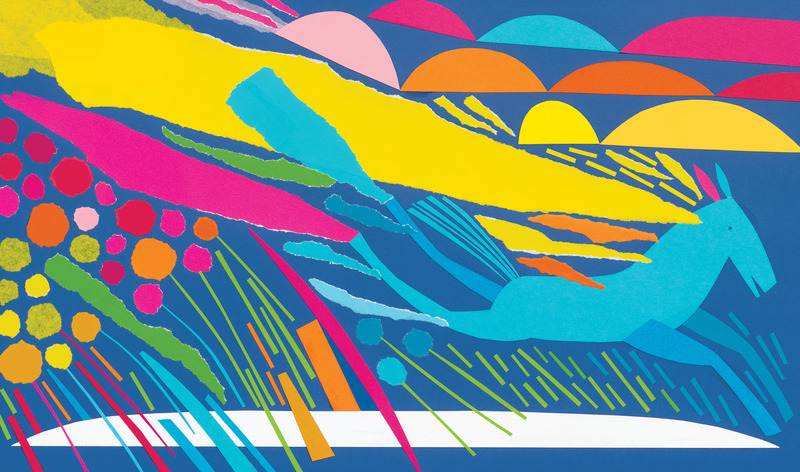 Then I added abstract shapes to the dark blue background, inspired by Valerio’s pages of rich color and collage. It was so delightful, I quickly made another with abstract bits and tiny hole-punched blooms. No horse this time, just color, shape, and surprise. Thank you, Margaret! 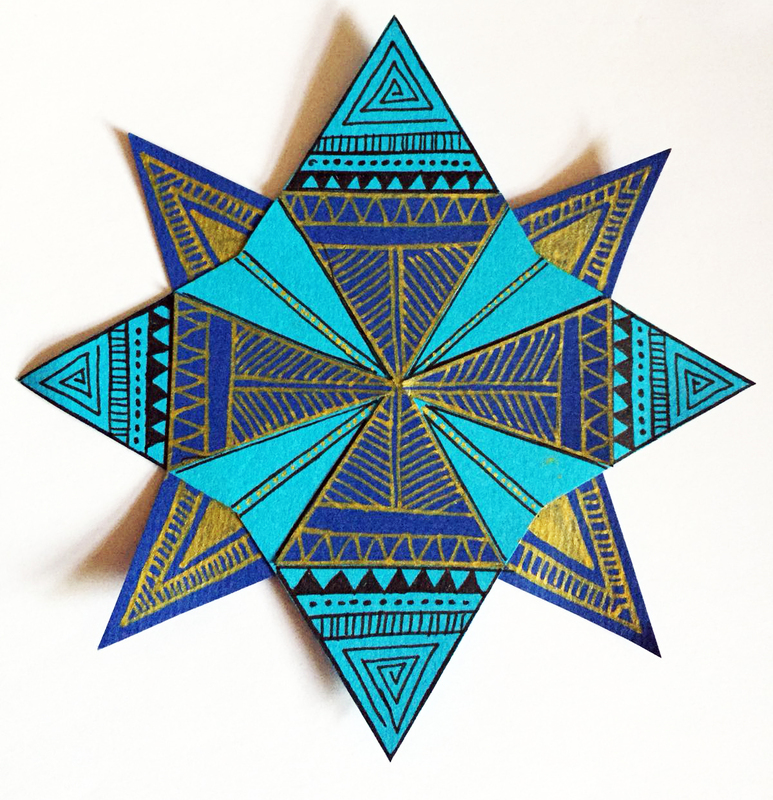 This craft is bursting with joy! Margaret is the author of Mabel One and Only (Dial Books for Young Readers) as well as Flip: How the Frisbee Took Flight, a nonfiction picture book slated for Fall 2019 with Charlesbridge Publishing. By day, you can find her wearing cat glasses and cardigans as the children’s librarian at Hardy Elementary School in Arlington, Mass. In her free time, she makes wacky, colorful crafts at homemade city. 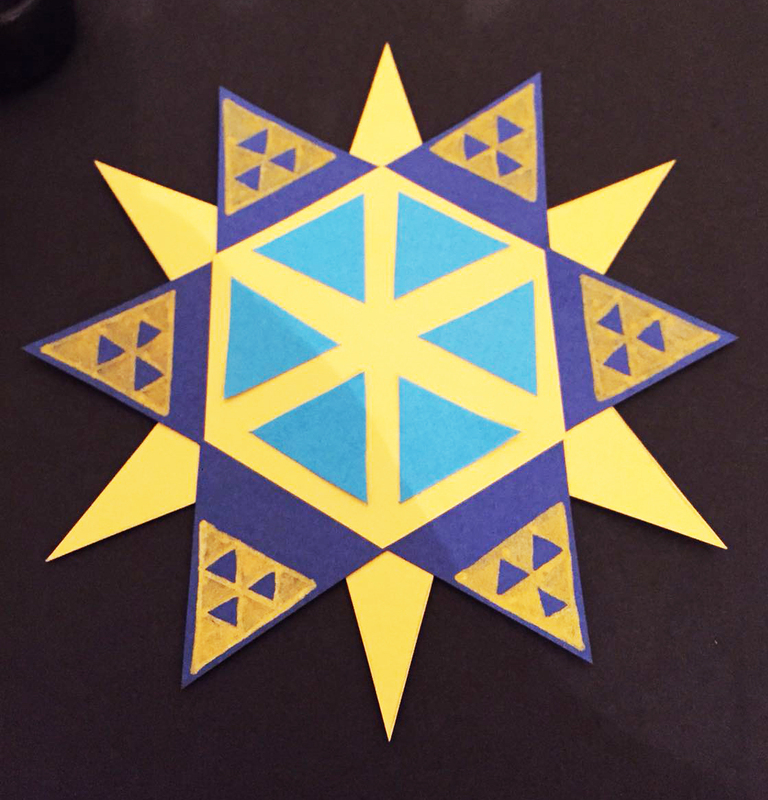 You might also want to check out this NORMAL NORMAN paper craft Margaret from homemade city featured here a while back! 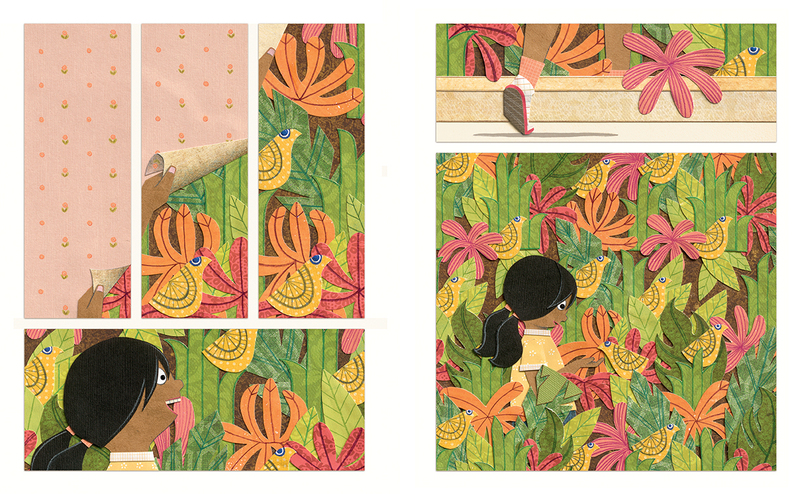 You’re Safe With Me by Chitra Soundar & Poonam Mistry (2018). 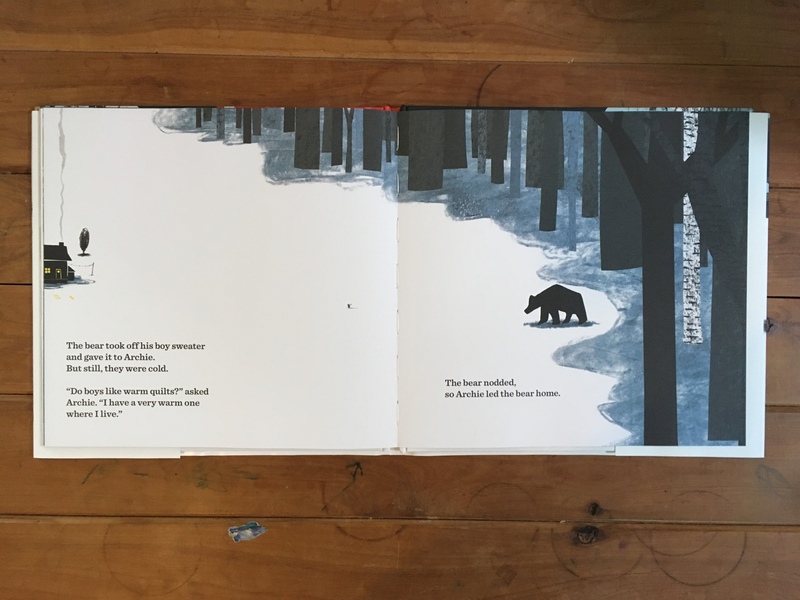 This picture book is the story of baby animals in the forest, afraid of the startling sights and sounds of the night, wind, and rain. And it’s the story of Mama Elephant who comforts them, telling them the ways the elements that appear scary are actually necessary—natural parts of the world that deliver good, wondrous things too. “You’re safe with me,” Mama Elephant says again and again, as comforting as any lullaby. That refrain, and all her stories of the world around them, put the animals peacefully right to sleep. 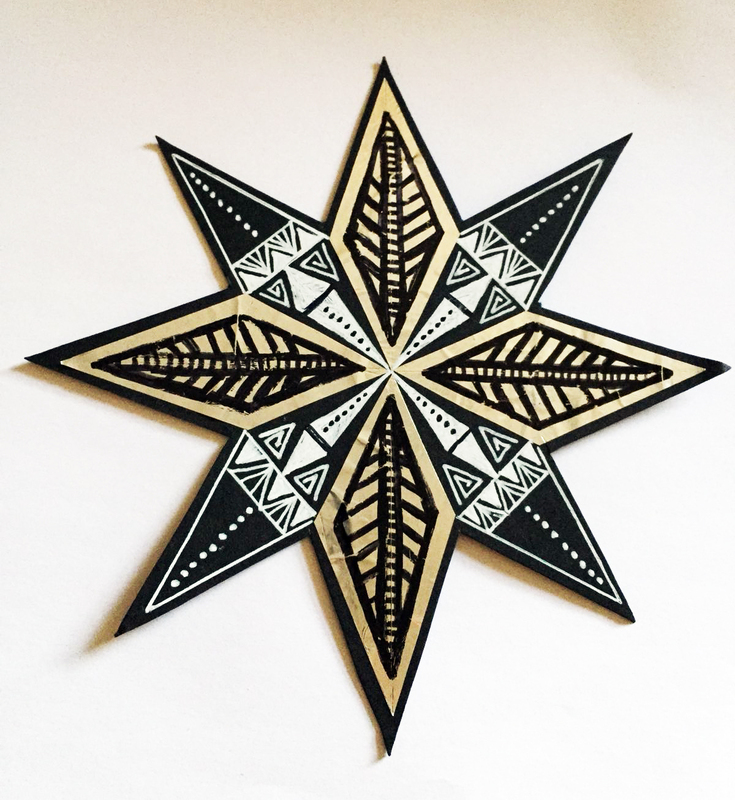 “My style incorporates my love of nature and explores the relationships between pattern, shapes and colour creating beautifully intricate illustrations. “You’re Safe With Me was inspired by the rich oral storytelling tradition I grew up [in]. My grandmother and her sister told me stories from Hindu epics and my mother made up stories whenever I asked for a new one. I visualised Mama Elephant as a storyteller who tells a little story for each of the elements of the thunderstorm to help the little animals deal with their fear, and at the same time reassures them that she’s there to look after [them] no matter what. 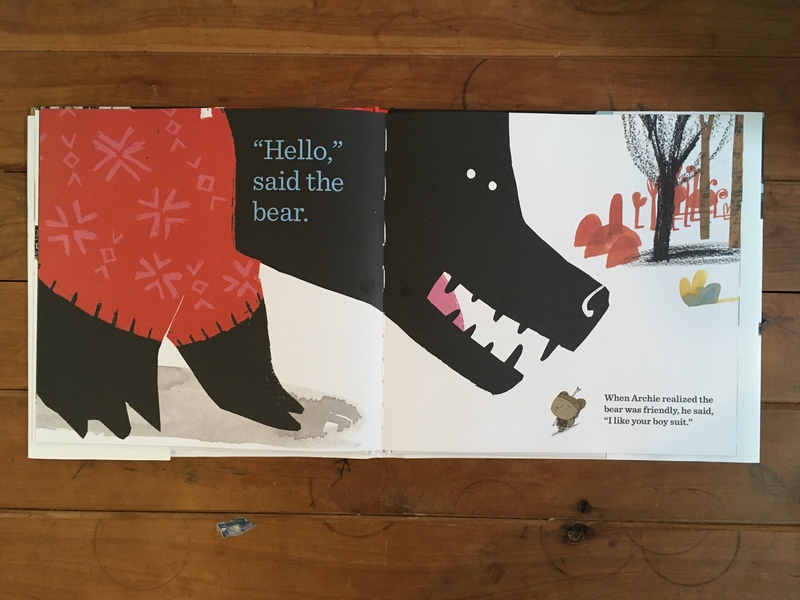 You’re Safe With Me is a book for soothing a little one to sleep, a book for embracing the natural world in new ways, a book for cherishing our loved ones who make us feel safe in any storm. Big thanks to Lantana Publishing for the review copy and images, and to Poonam and Chitra! 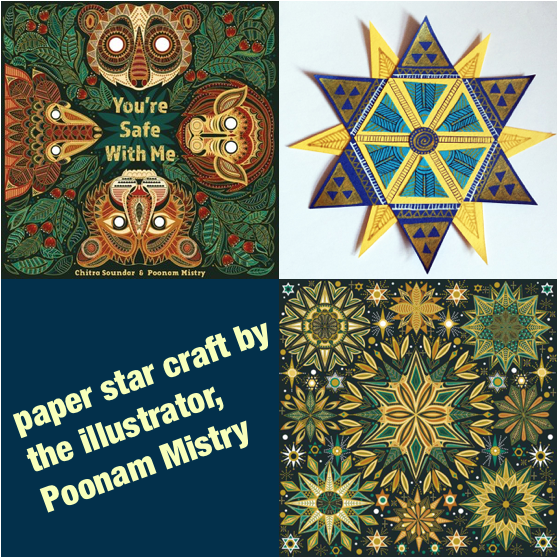 The illustrator herself, Poonam Mistry, has designed a corresponding craft for You’re Safe With Me! Mirroring her intricate artwork in the book, she’s here to show us how to make our very own paper stars! And she’s got printable templates too. 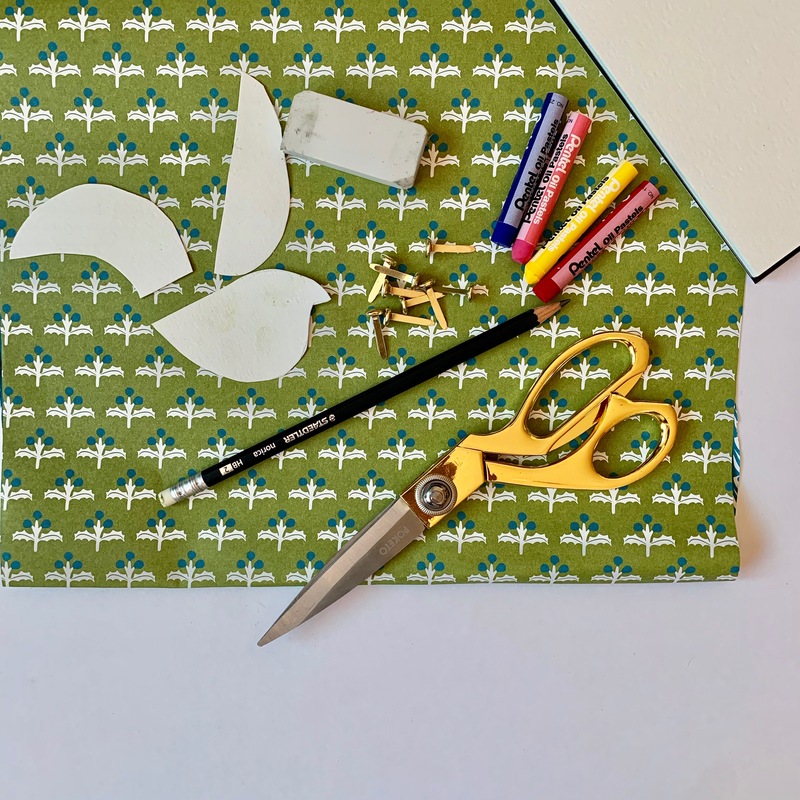 Print and cut out the templates using the scissors. (Templates found here and here.) Trace around these on the coloured card or paper using a pencil. It is best to use 2/3 colours. 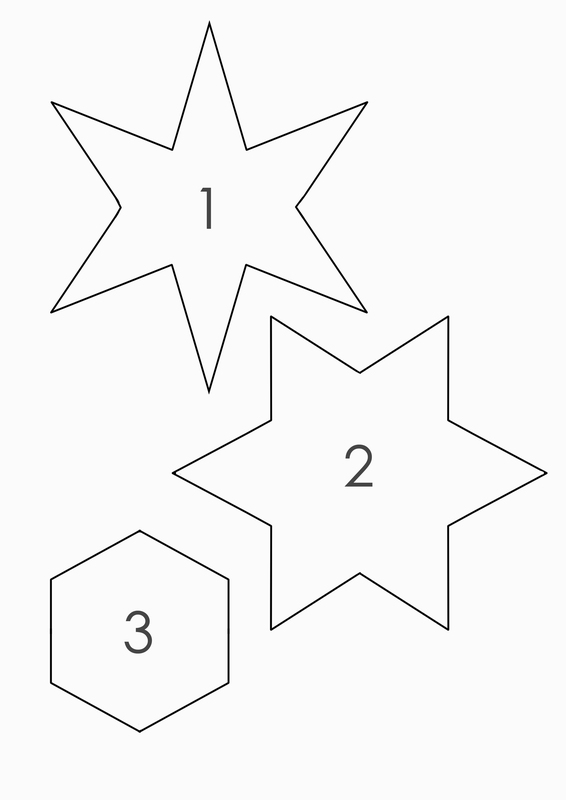 Cut around these and stick together in order using glue (3 should be on top with 1 at the bottom). 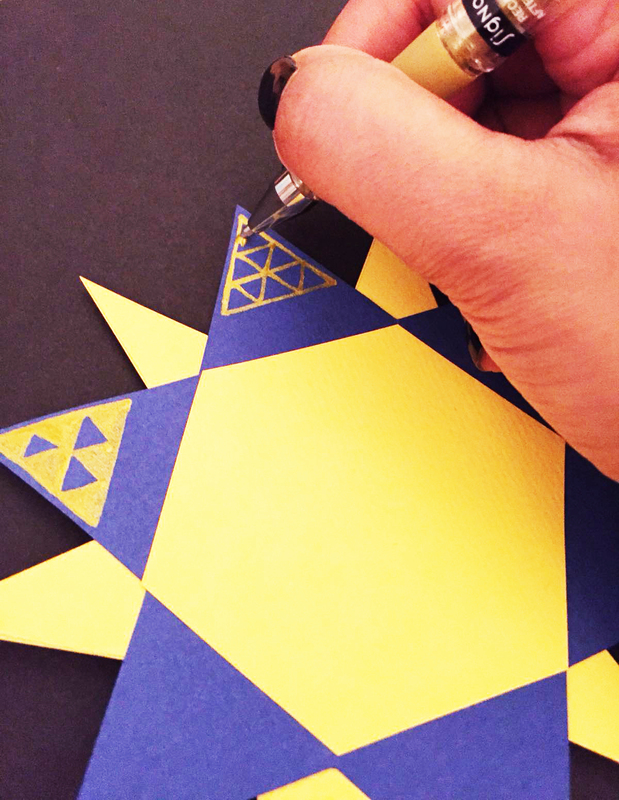 Add triangles or circles on the points of the star using pencil colours, felt tips of pencil colours. I used a gold gel pen in this example. 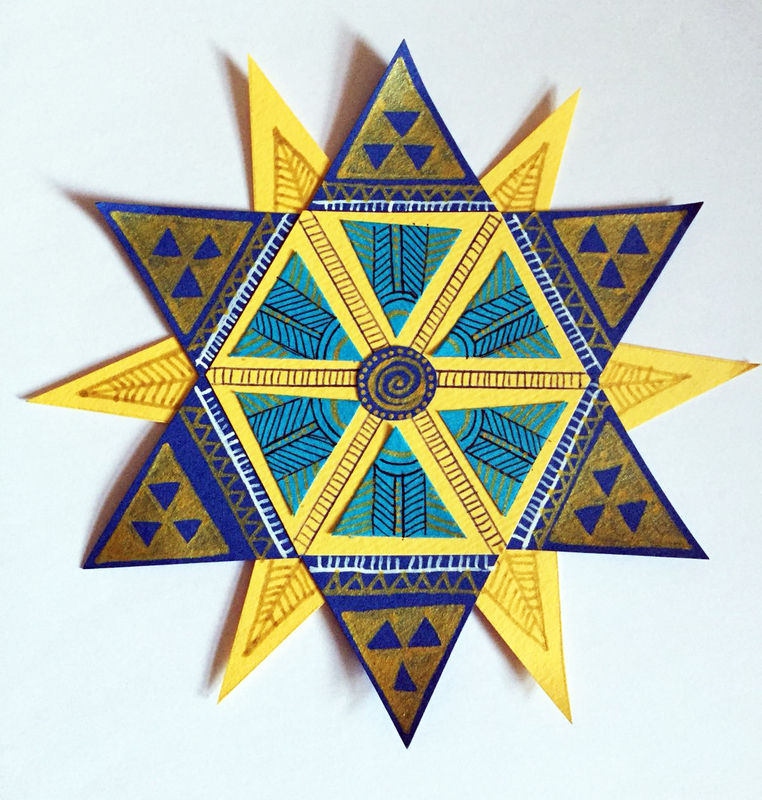 Cut out smaller shapes in coloured card/paper and glue these to add more patterns. Triangles work best. 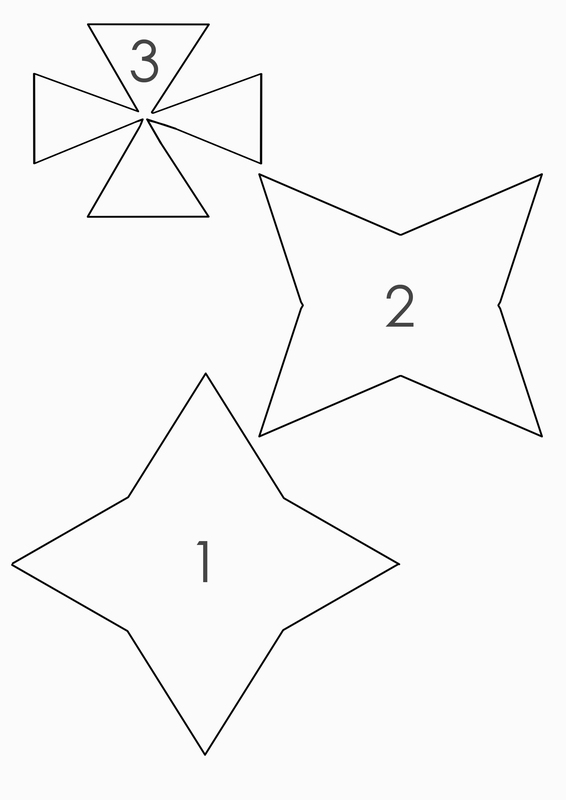 You could add foil shapes if you wanted to make your star sparkle. Add the last patterns and details on top drawing geometric shapes and spirals. Finally, Put a hole through one point of the star. Thread the string through it and tie a knot at the ends to hang it. 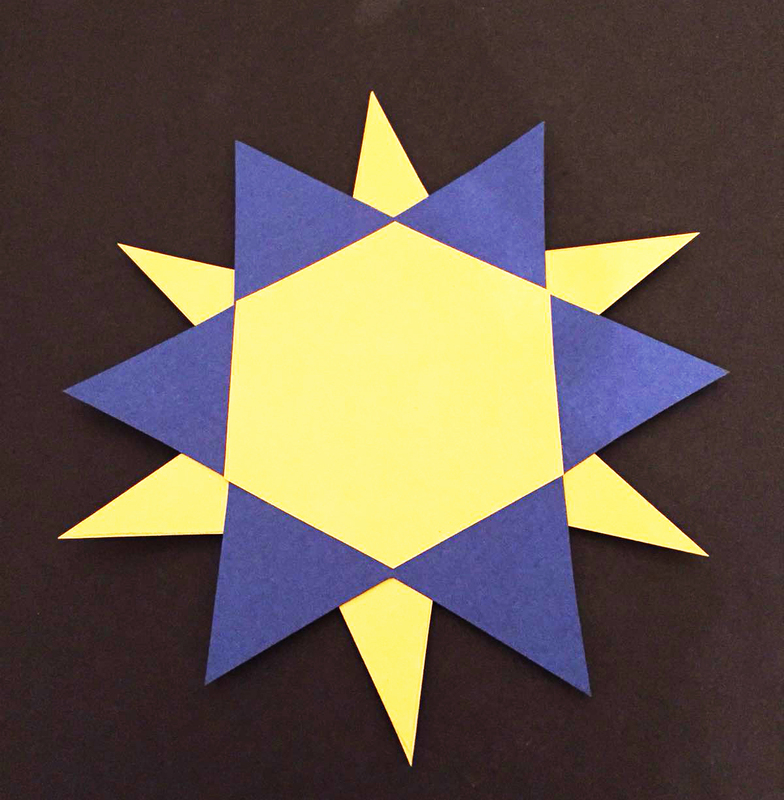 Thank you so much, Poonam, for designing and sharing this special star craft!